Google Web Designer beta now available: Build beautiful HTML5 creative with ease. By now, it’s evident that multi-screen consumption is the way of the future; mobile and tablet devices are becoming consumers’ first screens, so the content that is developed needs to work seamlessly across these screens. There are already more end-users in HTML5-compatible environments than there are in Flash-compatible environments, and HTML5 ad spend is expected to overtake Flash spend within the next two years. (1) But until recently, advertisers didn't have the tools they needed to easily develop content fit for today's cross-screen experiences. To shine a light on the issues, we commissioned a research study with Illuminas to uncover the barriers that agencies face when buying on and developing for mobile platforms. We found that advertisers expect the amount of mobile and tablet work they do to increase by 41% over the next 12 months, and over 67% of respondents believe that it’s important to design specifically for mobile campaigns. However, even though the amount of mobile and tablet work is expected to increase, cross-screen creative can be difficult to adopt. In our white paper, “Unlocking the HTML5 Opportunity: What’s the Holdup?” we present four main challenges that agencies face when approaching mobile advertising. One key challenge is that there are too many choices to make when developing for mobile -- too many platforms, browsers, and devices to build for, and no tools that simplify the development process. We’re working hard to solve this development challenge by offering agencies powerful yet easy-to-use tools for HTML5 production. In this vein, we announced DoubleClick Studio Layouts for HTML5 back in August, which lets you create HTML5 ads in minutes, and last week we announced Ready Creatives in AdWords, which creates HTML5 ads for you in seconds. From managing inventory levels, to juggling promotions and tackling catalog churn -- online retail moves quickly, and so should you. Register here to attend the Hangout on September 25th, 2013 at 11:00am PST / 1:00pm CST / 2:00pm EST. Tune in for the session, and interact with the panel via Hangouts-enabled Q&A. When you’re in display advertising, school is always in session. And now is is the perfect time to build your skills! We’ve heard from DFA users that they need more customized learning based on how they use DFA. For example, if you’re an ad trafficker, you might need a broad understanding ranging from the basics all the way to troubleshooting. If you’re an analyst, you might not need to know all the details a media planner might be responsible for but you might still like to know how conversion data is tracked and counted. To help you learn through a more established, role-based curriculum, we’ve launched DFA Academy, an easy-to-use, self-paced learning path designed to guide you through core help articles and online training courses. Since DFA Academy covers a lot of material, we've set it up in checklist format so you can track progress by checking the boxes at the end of each step. Your progress will be saved so if you have to take a break, you can come back anytime and pick up where you left off. Whether you're a freshman ad trafficker new to display, an analyst on the Dean’s list, or a Media planner feeling like a 5th year student, you can find customized training based on your role to help you ace DFA. Keep in mind, the DFA Help Center is only available to current DFA users so you'll need to sign in with the Google account you use for DFA. Want extra credit? Be sure to also sign up for the DoubleClick Digest to get the latest DoubleClick news, research, events and product updates. DoubleClick Ad Exchange (AdX) launched the first Preferred Deal in 2012 and the first Private Auction in 2013 to help publishers and advertisers create greater opportunities with programmatic buying. Since the beginning of this year we’ve seen the number of Preferred Deals double, the number of Preferred Deals impressions grow by 2.5X, and Private Auction impressions explode from nothing to millions per day. As these programmatic deal types become more important for our partners, they started asking for the ability to negotiate deals on the go. So today, we’re excited to launch a Mobile version of the DoubleClick Ad Exchange Deals interface. 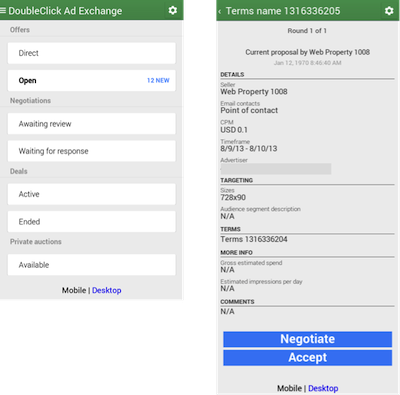 The new DoubleClick Ad Exchange Deals interface for mobile allows buyers and sellers to check the status of a Preferred Deal or Private Auction on any device. When you sign into the Deals interface on your phone or tablet, the mobile site will load automatically. From there, buyers and sellers can view, edit, accept, or stop existing deals. If at any time you need to access other features, you can switch to the classic version of the Deals UI by clicking on the Desktop link at the bottom of the screen. We built this mobile interface to help DoubleClick Ad Exchange partners continue their deal negotiations while away from their desks and it’s available now for all users. To access it, just visit www.google.com/adxbuyer/uploader from your mobile browser and visit our Help Center for buyers or Help Center for sellers to learn more.